Important warning: there is a very real danger of electric shock, even if you follow these steps carefully. Use at your own risk. The right ballast is the critical. If you get the wrong type, it won’t put out the right amount of light, the color temperature won’t be right, and worse, you’ll get flicker or rolling black bars on camera. I thought it’d be more convenient to mount the ballasts directly to the light, Diva-style, rather than have them dangling around. 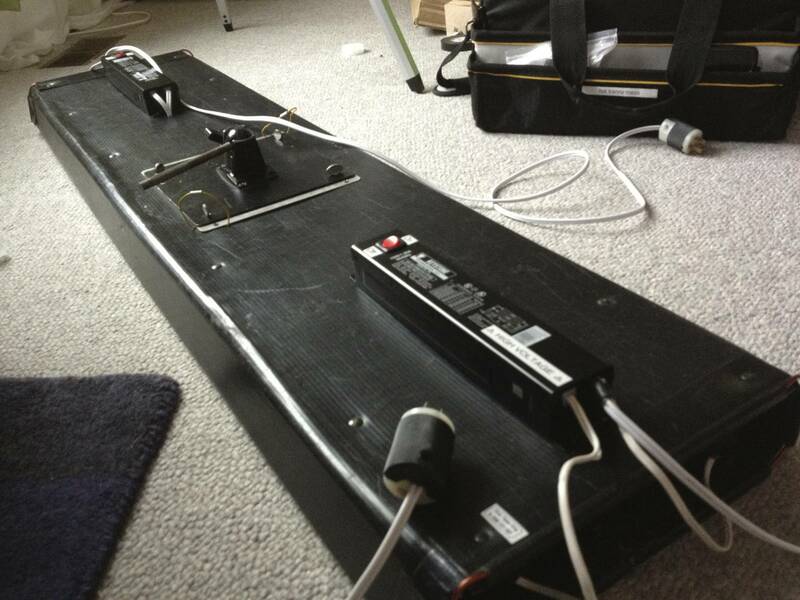 To do this, I drilled holes on either side of the fixture and zip tied the ballast through its mounting holes. I chopped off most of the existing wiring on the ballasts and took the cover off, then used the housing to mount the switch and conceal the wiring. I used a drill press at work to punch a hole in the housing to mount the switch to, and I just used the existing cutouts to run the wires to the lamps and for the power cord. 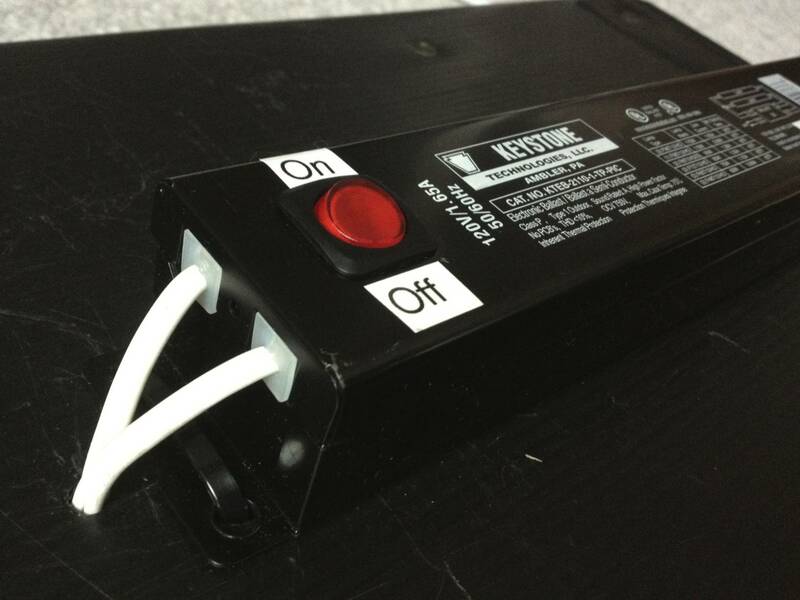 You could alternatively opt for no switch or an inline switch in the power cord. The wiring is simple, follow the diagram on the ballast. If you use the same lighted switch I did, you can wire it one of two ways depending on whether you want the light to come on whenever there’s power to the unit, or only when the switch is on. Be careful where you place the switch, as there isn’t a lot of room in the ballast to route the wires. I used to separate power cords for the ballasts, but if I make another one, I’m going to run them off the same power cord. 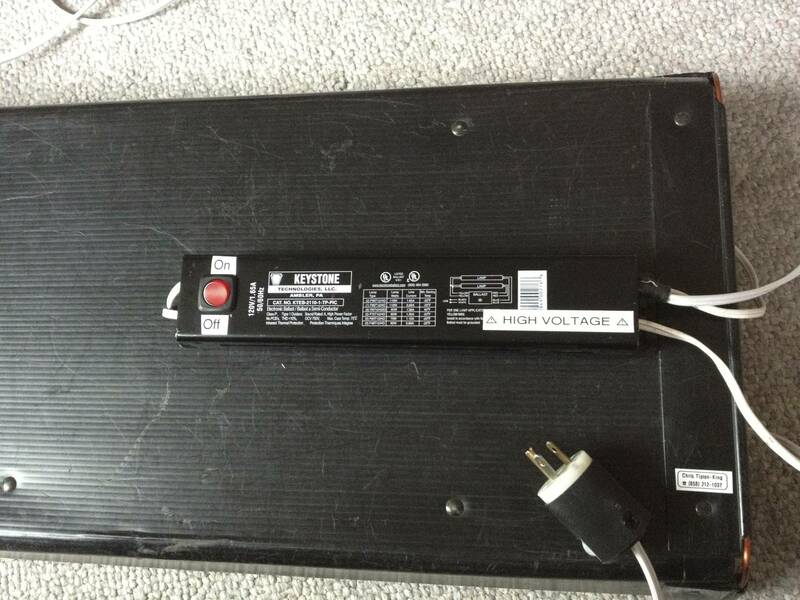 Note that with these ballasts, you can only turn off/on the lamps in groups of two: the ballast won’t operate if one lamp is unplugged. This is just what I’ve been looking for. Question, are you sure you don’t need 8x Kino Flo Locking Lamp Connectors (one for each side of the tube)? The barndoorlighting website indicates 2x per lamp. You’re right, I updated the instructions accordingly. I just finished my first DIY Kino and it’s beautiful! Question–when the lights are on do you feel a slight electric current running through the reflector and metal bolts? My reflector is picking up a small high voltage electric current from the lamps. Is this normal? Should I ground the reflector or would that cause a ground fault? I wonder how the Kino ballasts solve this problem or if they do. While I’ve never felt this directly, friends who’ve borrowed the light have said the same thing. The actual Kino wiring harnesses don’t ground the reflector, so it appears to be beyond my electrical expertise to explain what’s happening. I guess you should be careful to unplug the light before relamping it and avoid touching the reflector in operation. Maybe it’s coming from the ballasts mounted so close to the reflector? In a standard fluorescent fixture (where the ballasts are mounted similarly close) the reflector and housing WOULD be grounded. We took a bit of the extra wire from the ballast and grounded the reflector. It did not cause a ground fault and it’s worked beautifully. The lights are gorgeous! Thank you so much Chris!!! These look awesome!! Just wondering how much the total cost was? I just looking to make something similar to kino flo and I stumble your post. Thank you Chris! – if the KF55 are 75w? – the seller (http://www.jcxex.com) its from US? – you have an video link where you use these lights? Thank you again for all your help Chris. One more question if you are kind Chris: can you please tell me how noisy they are?